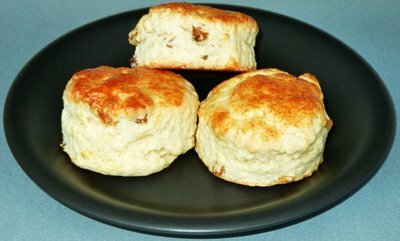 "SCONES“ are a traditional tea time speciality served throughout England, Scotland and Wales. Nowadays, we find "SCONES" out of the United Kingdom in all variations (cornmeal, oatmeal, whole wheat, etc...) and combinations possible (pumpkin, chocolate, dried and candied fruits, cheese, herbs, etc...) . They are fastly prepared and are always well appreciated for their homely taste and soft spongy texture. 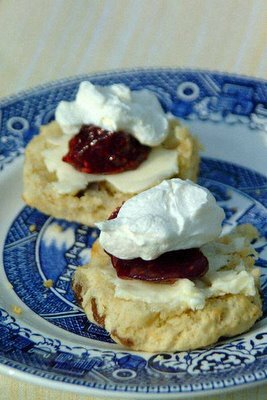 I’ve decided to give you two sweet “SCONE” recipes in order for you to bake the version you fancy the most depending on situations and your personal taste of the moment. Those recipes were taken from the 40th edition of BE-RO’s “Home recipes”, a book for all homebakers in search of good old English baked specialities! As usual, I deliberatly changed a few details in order for you to make this recipe as successful as possible. 1. Heat oven to 220°C (425°F) and grease a baking tray. 2. Mix together flour, baking powder and salt and sieve. Rub in butter. 3. Make a well in the center. Add milk and incorporate well (with the help of a knife) by cutting and turning the dough until it forms a clean ball. 4. Knead lightly on a floured surface and roll out to 1.8 cm (0.7 inch) in thickness. 5. Cut into 6.5cm (2 1/2 inches) rounds with a scone cutter*. 6. Brush the tops with egg and milk glaze. 3. Stir in sugar and fruit. 4. Make a well in the center. Add egg and milk mixture, reserving a little for brushing the tops. Incorporate well (with the help of a knife) by cutting and turning the dough until it forms a clean ball. 5. Knead lightly on a floured surface and roll out to 1.8 cm (0.7 inch) in thickness. 6. Cut into 6.5cm (2½ inches) rounds with a scone cutter*. 7. Brush the tops with egg and milk glaze. A “SCONE” dough should be soft and spongy, but never too wet or sticky.Don’t work the dough too much; handle it very lightly for best results. Don’t roll out too thinly. Both “SCONE” versions are fine when they are halved, buttered and served with jam (raspberry, strawberry, apricot, etc…) and whipped double cream. “RICH SCONES” are also delicious when they are just halved and served buttered. *A plain or fluted round metal or plastic ring used for cutting out scones.